The weather is getting warmer, the days are becoming longer and the French Riviera is preparing itself for what is bound to be another cracking summer! April sees the 2013 Antibes Yacht Show and the Monte Carlo Masters tennis tournament come to town, creating a buzz on the luxurious Côte d’Azur, where everyone starts to get excited about the upcoming summer season. The Antibes Yacht Show is one of the largest boat shows in the world and provides brokers the perfect opportunity to review yachts for this summer’s season in the West Mediterranean. The Monte Carlo Masters is an annual tennis tournament, which features the highest ranked players on the ATP Tour. Although it appears that Novak Djokovic may have to pull out due to injury, Andy Murray and Rafael Nadal will be at the tournament searching for form ahead of the extremely prestigious French Open Grand Slam at Roland Garros. May sees the world famous Cannes Film Festival and Monaco Grand Prix come to the French Riviera, two of the worlds most famous events. Spot the stars of the movie world as they walk down the famous red carpet at the Palais des Festivals in Cannes. The Monaco Grand Prix is one of the most competitive and unpredictable Formula One motor races in the world. There is nothing to rival the atmosphere of these two events and you should definitely check them out while you’re in town. While all these prestigious and luxurious events are in town, there is no better time or place to charter a luxury yacht. Whether it is for corporate or personal entertaining, chartering a luxury yacht provides unforgettable memories for everyone involved. 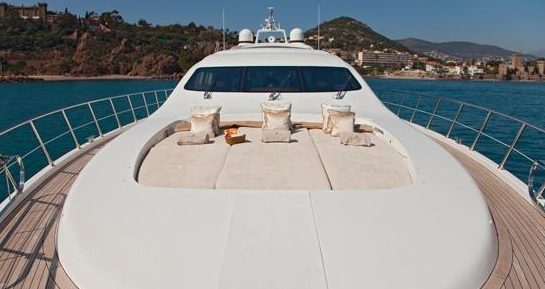 Charter a stunning Mangusta like BEAR MARKET and head towards Monaco to celebrate these events. She accommodates up to 8 guests in 4 cabins, as well as 12 passengers for day charters and 20 for corporate events at dock. 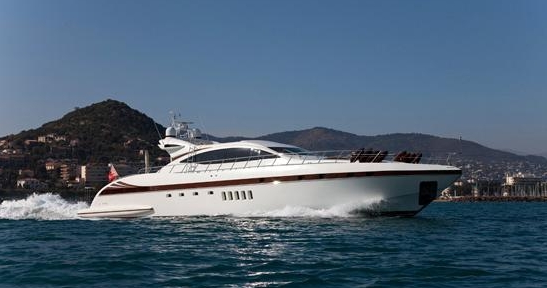 She is one of the sleekest, fastest and most sought after Mangusta motor yachts on the French Riviera. Enquire today before it is too late! At www.boatbookings.com, we are here to help you plan your perfect luxury yachting holiday. We have a team of highly skilled professionals who are extremely knowledgeable in their destinations and will be able to help you bring together the yacht, the crew and all the other aspects that make your charter special. At Boatbloggings we will keep you updated on the latest industry show releases, news and gossip in the yachting world. If you are looking for more information on yachts, charters and other yachting gossip, please become a fan and like our Facebook page to receive up to date information on our publications. Follow us on Twitter and Google Plus too.